I love the street where we live. 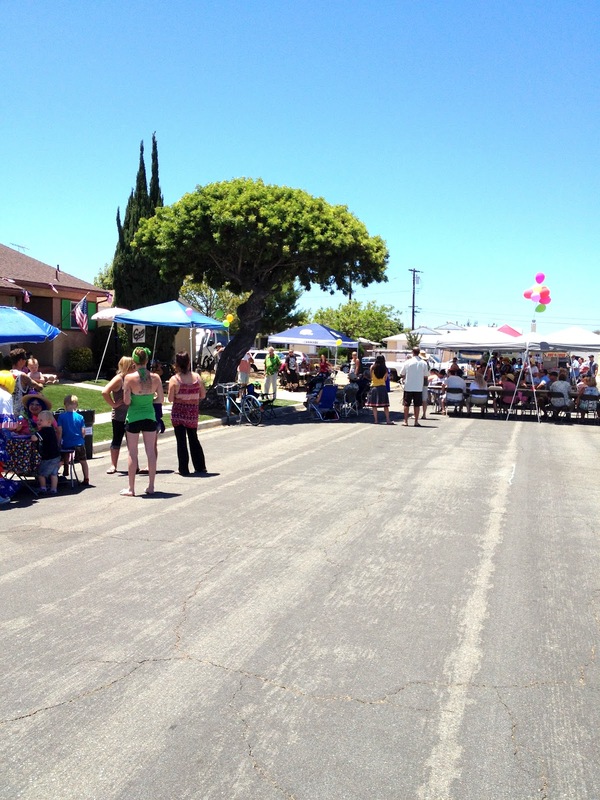 On Saturday we had a neighborhood block party put together by my 80-something year old neighbor, Joe. Joe is the "keeper" of our street. He knows when people are out of town and puts their trash cans away when they're gone. He checks on my military wife neighbor whose husband is deployed. He brings the kids Christmas and Easter presents and every afternoon, he walks down the street and smokes his cigars (not so crazy about that one but he at least he always puts it behind his back around other people). We like Joe. He's lived in the same house across the street from ours since the early 1950s. A few months ago he told me that he was going to throw a block party. I thought that was a great idea and offered to help him plan it but he emphatically said that he was going to do it all himself. Well, this wasn't just a little potluck party with a few lawn chairs. 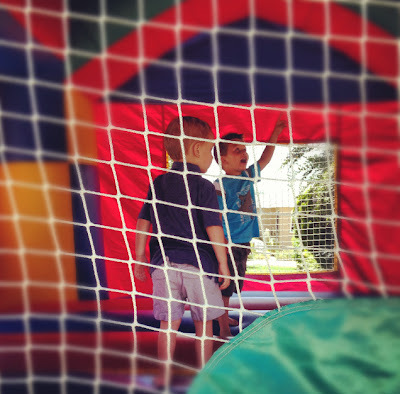 He rented two jump houses (one for the "big kids" and one for the younger kids), a dunk tank, ping pong tables, clowns who did face painting and balloons, a food truck with shaved ice, popcorn, hot dogs, hamburgers, french fries and even live music (which was really fun to listen to even when I came inside to feed the baby). He sang a lot of great music and had a fun personality that kept the party going for several hours. There were canopy tents with long tables and chairs, tons of drinks and even a designated smoking area. I appreciated that people weren't smoking around all the kids. Joe even opened up his own house for people to use the restroom so they wouldn't have to leave the party. It was the block party of all block parties! William did not want it to end! I was really surprised when William said he wanted his face painted. He normally doesn't allow strangers to come near him (which is often OK by me) and I thought he would be afraid of the clowns but they were super nice. When she asked what he wanted painted on his face, he said, "A doggy." So, a doggy he got. Isn't he the cutest little puppy dog you ever did see? When we got home I picked him up and let him stand in front of the mirror. He was really into himself and stood there for a while, checking himself out. Then he started making all kinds of funny faces while I died at his cuteness. He is the cutest puppy dog I have ever seen or ever will see! Sooo cute!! Love his matching puppy dog eyes that go with his face painting!! Cuteness! And oh my that block party!!! 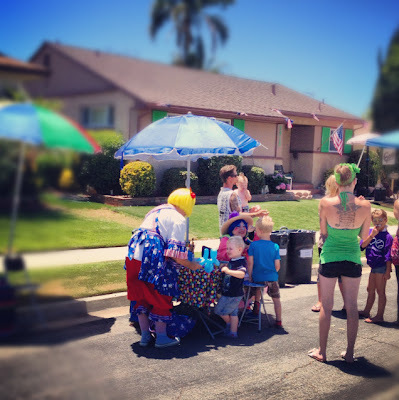 Is joe available to throw a party in our neighborhood? I can't believe one old guy put that whole thing on!! Super impressive! Can we see a pic of this amazing Joe? What a cool guy! LOVE! Maybe you should keep your eyes peeled for any rentals on your block. I might just have to move on in! !